R3510-WL is rated 4.8 out of 5 by 4. Install this Single Handle Wall-Mount Lavatory Rough-In Kit for use with the wall-mount bathroom faucets. 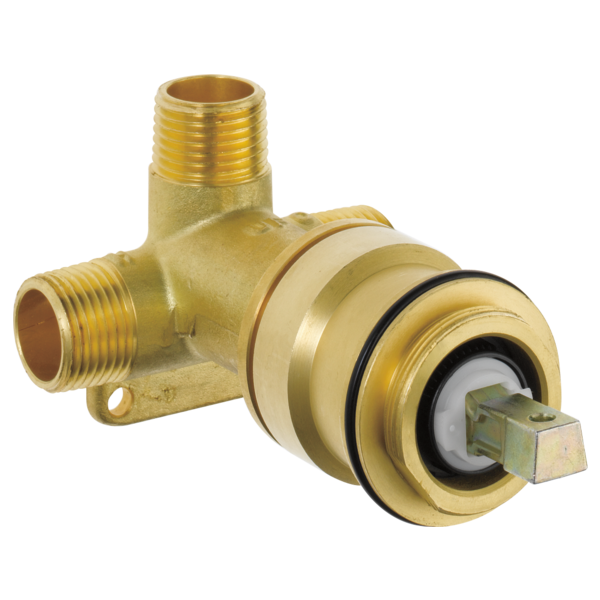 This lead-free brass body ships with the valves and plaster guards for a hassle-free installation. As part of a company that delivers water every day through millions of faucets worldwide, Delta provides a lifetime limited warranty on all parts to the original consumer. Maximum rough-in depth 2-3/4 in. Rated 5 out of 5 by FOUNDRYno201 from Great product & great value. Our plumber had no issues with installation, and it works great thus far. We finished the install with Delta Trinsic 1.2 gpm wall mount faucet and love the look. Rated 5 out of 5 by ASeers from Does what it should! Rough in valve arrived quickly and was exactly what I needed. Quality is great and what you would expect from Delta. Rated 5 out of 5 by Nathalie from Do it's job. Just got this installed working fine. No issues. Is this the correct rough for the Trinsic T3559LF-WF? Web site says that the 3559LF-WL, which is combo of both the Trinsic wall-mount lav faucet trim and its rough-in, has been discontinued. The two parts (the trim and the rough) need to be purchased per item, and this Tesla rough is the one to use with the Trinsic. Yes? How Tight Should the Valve Cartridge Sleeve Be? I'm trying to assemble this product with a Delta trim kit. I screwed the valve cartridge sleeve over the valve cartridge and onto the valve body. Then I tried to attach the valve trim and handle,... it didn't fit properly because the valve stem didn't protrude far enough to attache the handle screw. I decided that was the result of the valve cartridge sleeve no being fully engaged on the threads. So, I tried to tighten it with a pipe-wrench,... the result was that I destroyed the valve cartridge! What am I doing wrong? Page 3 of the installation sheet appears to show the o-ring belonging on the male thread of the manifold, however, the only o-ring supplied came pre-installed on the male thread of the housing. Which location is correct? Can this valve be mounted upside-down? What happens if it is installed upside down though? I'd like to put the valve handle above the spout, rather than to the side. Will the valve not function correctly? It seems as if the mixing mechanics would be the same.... Thank you to anyone who can explain why I shouldn't do this. How much space should one leave above the portion of the valve body that turns upward?